The one thing robots, despite ever-increasing powers, tend not do very well is emote–just think of Asimo’s blank face and you’ll see what I mean. But here come Noby and M3-Kindy to change that … and seriously creep you out. The two bots were revealed today by creators the JST Erato Asada Project–a research team dedicated to investigating how humans and robots can better relate to each other in the future and so that robots can learn better (though given the early stages of current artificial intelligence science, it’s almost a case of working out how humans can feel better about interacting with robots). Team leader Professor Minoru Asada from Osaka University feels that one way robot intelligence can be boosted is to get them to learn in a similar way to the way we do, and these robots are part of this effort. The first is M3-Kindy, a 27-kilo machine with 42 motors and over a hundred touch-sensors. He’s about the size of a 5-year-old child, and can do speech recognition, and machine vision with his stereoscopic camera eyes. Kindy’s also designed to be led around by humans holding its hand, and can be taught to manipulate objects. But it’s Kindy’s face that’s the freakiest bit. It’s been carefully designed so that it can portray emotions. That’ll undoubtedly be useful in the future, when, for instance, having more friendly, emotionally attractive robot carers look after elderly people and patients in hospitals is going to be important. But it also unquestionably raises some of those same vaguely unsettling emotions as you get when watching Sonny in I, Robot. And if Kindy has given you goose-bumps, then Noby will have you running out of the room. 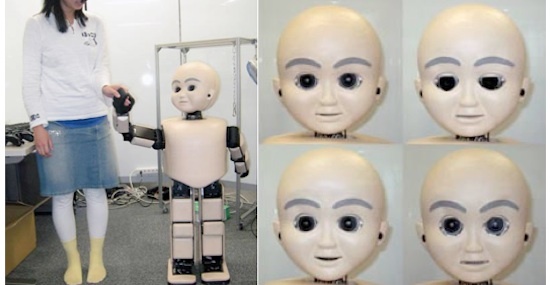 It’s a similar human-machine interaction research droid, but is meant to model a 9-month-old baby, right down to the mass and density of its limbs and soft skin. It’s strictly designed to help test “cognitive development” models for artificial intelligence by replicating some of the same interactions with the world that a 9-month-old does. Both ‘bots teach us something about the imminent future though: We’re just getting used to gadgety-looking robots like Roombas in our lives, and we know robot butlers and health carers are just around the corner. In just a few years then, these devices will be able to emulate facial expressions, and we’ll have to get over our fears of a smiling-faced robocalypse pretty quickly.